Complement your existing kitchen furniture and cabinet styles with one of the solid wood trash bins offered by Brandenberry Furniture. Find a trash bin below and contact Brandenberry staff so it can be built for your home. Did you know that your trash container can be so beautiful? Upgrade the simple white trash can in your kitchen with a new Trash Bin. 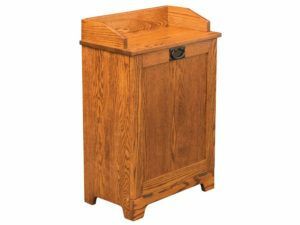 Hide the ugly contents inside the trash bag with a gorgeous new solid wood trash bin from Brandenberry Amish Furniture. The trash bins can be custom built to match your kitchen and dining room furniture. In addition, you can even select the color finish that is applied. Especially relevant, with proper care and maintenance the wood bin can become a family heirlooom. Enjoy the solid wood grains highlighted in the wood. And, the solid wood bin is built in America! Visit our Amish Furniture Store in Shipshewana Indiana and see a selection of Handcrafted Amish Furniture.